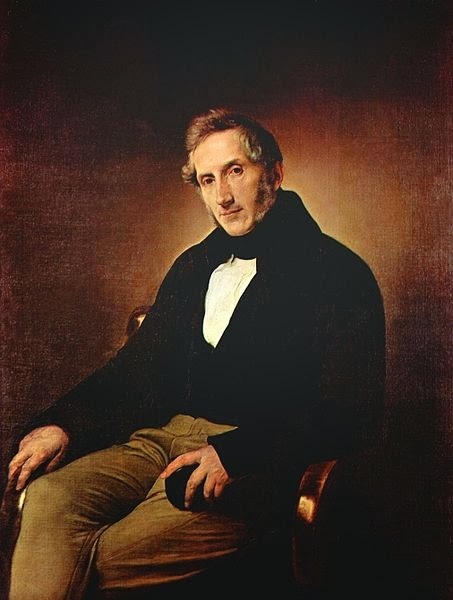 Alessandro Manzoni (1785–1873). I Promessi Sposi. Because of a fancy for a peasant girl, the tyrannical lord of an Italian village sent desperadoes to threaten the priest if he mar­ried the girl to her village lover. THAT branch of the lake of Como, which extends towards the south, is enclosed by two unbroken chains of mountains, which, as they advance and recede, diversify its shores with numerous bays and inlets. Suddenly the lake contracts itself, and takes the course and form of a river, between a promontory on the right, and a wide open shore on the opposite side. The bridge which there joins the two banks seems to render this transformation more sensible to the eye, and marks the point where the lake ends, and the Adda again begins—soon to resume the name of the lake, where the banks receding afresh, allow the water to extend and spread itself in new gulfs and bays. The open country, bordering the lake, formed of the alluvial deposits of three great torrents, reclines upon the roots of two contiguous mountains, one named San Martino, the other, in the Lombard dialect, Il Resegone, because of its many peaks seen in profile, which in truth resemble the teeth of a saw so much so, that no one at first sight, viewing it in front (as, for example, from the northern bastions of Milan), could fail to distinguish it by this simple description, from the other mountains of more obscure name and ordinary form in that long and vast chain. For a considerable distance the country rises with a gentle and continuous ascent; afterwards it is broken into hill and dale, terraces and elevated plains, formed by the intertwining of the roots of the two mountains, and the action of the waters. The shore itself, intersected by the torrents, consists for the most part of gravel and large flints; the rest of the plain, of fields and vineyards, interspersed with towns, villages, and hamlets: other parts are clothed with woods, extending far up the mountain. Lecco, the principal of these towns, giving its name to the territory, is at a short distance from the bridge, and so close upon the shore, that, when the waters are high, it seems to stand in the lake itself. A large town even now, it promises soon to become a city. At the time the events happened which we undertake to recount, this town, already of considerable importance, was also a place of defence, and for that reason had the honour of lodging a commander, and the advantage of possessing a fixed garrison of Spanish soldiers, who taught modesty to the damsels and matrons of the country; bestowed from time to time marks of their favour on the shoulder of a husband or a father; and never failed, in autumn, to disperse themselves in the vineyards, to thin the grapes, and lighten for the peasant the labours of the vintage. From one to the other of these towns, from the heights to the lake, from one height to another, down through the little valleys which lay between, there ran many narrow lanes or mule-paths, (and they still exist,) one while abrupt and steep, another level, another pleasantly sloping, in most places enclosed by walls built of large flints, and clothed here and there with ancient ivy, which, eating with its roots into the cement, usurps its place, and binds together the wall it renders verdant. For some distance these lanes are hidden, and as it were buried between the walls, so that the passenger, looking upwards, can see nothing but the sky and the peaks of some neighbouring mountain: in other places they are terraced: sometimes they skirt the edge of a plain, or project from the face of a declivity, like a long staircase, upheld by walls which flank the hillsides like bastions, but in the pathway rise only the height of a parapet—and here the eye of the traveller can range over varied and most beautiful prospects. On one side he commands the azure surface of the lake, and the inverted image of the rural banks reflected in the placid wave; on the other, the Adda, scarcely escaped from the arches of the bridge, expands itself anew into a little lake, then is again contracted, and prolongs to the horizon its bright windings; upward,—the massive piles of the mountains, overhanging the head of the gazer; below,—the cultivated terrace, the champaign, the bridge; opposite,—the further bank of the lake, and, rising from it, the mountain boundary. Along one of these narrow lanes, in the evening of the 7th of November, in the year 1628, Don Abbondio … curate of one of the towns alluded to above, was leisurely returning home from a walk, (our author does not mention the name of the town—two blanks already!) He was quietly repeating his office, and now and then, between one psalm and another, he would shut the breviary upon the fore-finger of his right hand, keeping it there for a mark; then, putting both his hands behind his back, the right (with the closed book) in the palm of the left, he pursued his way with downcast eyes, kicking, from time to time, towards the wall the flints which lay as stumbling-blocks in the path. Thus he gave more undisturbed audience to the idle thoughts which had come to tempt his spirit, while his lips repeated, of their own accord, his evening prayers. Escaping from these thoughts, he raised his eyes to the mountain which rose opposite; and mechanically gazed on the gleaming of the scarcely set sun, which, making its way through the clefts of the opposite mountain, was thrown upon the projecting peaks in large unequal masses of rose-coloured light. The breviary open again, and another portion recited, he reached a turn, where he always used to raise his eyes and look forward; and so he did to-day. After the turn, the road ran straight forward about sixty yards, and then divided into two lanes, Y fashion—the right hand path ascended towards the mountain, and led to the parsonage: the left branch descended through the valley to a torrent: and on this side the walls were not higher than about two feet. The inner walls of the two ways, instead of meeting so as to form an angle, ended in a little chapel, on which were depicted certain figures, long, waving, and terminating in a point. These, in the intention of the artist, and to the eyes of the neighbouring inhabitants, represented flames. Alternately with the flames were other figures—indescribable, meant for souls in purgatory, souls and flames of brick-colour on a grey ground enlivened with patches of the natural wall, where the plaster was gone. The curate, having turned the corner, and looked forward, as was his custom, towards the chapel, beheld an unexpected sight, and one he would not willingly have seen. Two men, one opposite the other, were stationed at the confluence, so to say, of the two ways: one of them was sitting across the low wall, with one leg dangling on the outer side, and the other supporting him in the path: his companion was standing up, leaning against the wall, with his arms crossed on his breast. Their dress, their carriage, and so much of their expression as could be distinguished at the distance at which the curate stood, left no doubt about their condition. Each had a green net on his head, which fell upon the left shoulder, and ended in a large tassel. Their long hair, appearing in one large lock upon the forehead: on the upper lip two long mustachios, curled at the end: their doublets, confined by bright leathern girdles, from which hung a brace of pistols: a little horn of powder, dangling round their necks, and falling on their breasts like a necklace: on the right side of their large and loose pantaloons, a pocket, and from the pocket the handle of a dagger: a sword hanging on the left, with a large basket-hilt of brass, carved in cipher, polished and gleaming:—all, at a glance, discovered them to be individuals of the species bravo. This order, now quite extinct, was then most flourishing in Lombardy, and already of considerable antiquity. Has any one no clear idea of it? Here are some authentic sketches, which may give him a distinct notion of its principal characteristics, of the means put in force to destroy it, and of its obstinate vitality. On the 8th of April, 1583, the most Illustrious and Excellent Signor Don Carlo d’Aragon, Prince of Castelvetrano, Duke of Terranuova, Marquis of Avola, Count of Burgeto, grand Admiral, and grand Constable of Sicily, Governor of Milan, and Captain-General of His Catholic Majesty in Italy, being fully informed of the intolerable misery in which this city of Milan has lain, and does lie, by reason of bravoes and vagabonds, publishes a ban against them, declares and defines all those to be included in this ban, and to be held bravoes and vagabonds who, whether foreigners or natives, have no occupation, or having it do not employ themselves in it … but without salary, or with, engage themselves, to any cavalier or gentleman, officer or merchant … to render them aid and service, or rather, as may be presumed, to lay wait against others … all these he commands, that, within the term of six days, they should evacuate the country, threatens the galleys to the refractory, and grants to all officials the most strangely ample and indefinite power of executing the order. But the following year, on the 12th of April, this same Signor, perceiving that this city is completely full of the said bravoes … returned to live as they had lived before, their customs wholly unchanged, and their numbers undiminished, issues another hue and cry, more vigorous and marked, in which, among other ordinances, he prescribes—That whatsoever person, as well as inhabitant of this city as a foreigner, who by the testimony of two witnesses, should appear to be held and commonly reputed a bravo, and to have that name, although he cannot be convicted of having committed any crime … for this reputation of being a bravo alone, without any other proof, may, by the said judges, and by every individual of them, be put to the rack and torture, for process of information … and although he confess no crime whatever, notwithstanding, he shall be sent to the galleys for the said three years, for the sole reputation and name of bravo, as aforesaid.All this and more which is omitted, because His Excellency is resolved to be obeyed by every one. At hearing such brave and confident words of so great a Signor, accompanied too with many penalties, one feels much inclined to suppose that, at the echo of their rumblings, all the bravoes had disappeared for ever. But the testimony of a Signor not less authoritative, nor less endowed with names, obliges us to believe quite the contrary. The most Illustrious and most Excellent Signor Juan Fernandez de Velasco, Constable of Castile, Grand Chamberlain of his Majesty, Duke of the city of Frias, Count of Haro and Castelnovo, Lord of the House of Velasco, and that of the Seven Infantas of Lara, Governor of the State of Milan, &c., on the 5th of June, 1593, he also, fully informed of how much loss and destruction … bravoes and vagabonds are the cause, and of the mischief such sort of people effects against the public weal, in despite of justice, warns them anew, that within the term of six days, they are to evacuate the country, repeating almost word for word, the threats and penalties of his predecessor. On the 23rd of May, in a subsequent year, 1598,being informed, with no little displeasure of mind, that … every day, in this city and state, the number of these people (bravoes and vagabonds) is on the increase, and day and night nothing is heard of them but murder, homicide, robbery, and crimes of every kind, for which there is greater facility, because these bravoes are confident of being supported by their great employers … he prescribes anew the same remedies, increasing the dose, as men do in obstinate maladies. Let every one, then, he concludes, be wholly on his guard against contravening in the least the present proclamation; for, instead of experiencing the clemency of His Excellency, he will experience the rigour of his anger … he being resolved and determined that this shall be the last and peremptory admonition. Not, however, of this opinion was the most Illustrious and most Excellent Signor, Il Signor Don Pietro Enriquez de Acevedo, Count of Fuentes, Captain and Governor of the State of Milan; not of this opinion was he, and for good reasons. Being fully informed of the misery in which this city and state lies by reason of the great number of bravoes which abound in it … and being resolved wholly to extirpate a plant so pernicious, he issues, on the 5th of December, 1600, a new admonition, full of severe penalties, with a firm purpose, that, with all rigour, and without any hope of remission, they shall be fully carried out. We must believe, however, that he did not apply himself to this matter with that hearty good will which he knew how to employ in contriving cabals and exciting enemies against his great enemy, Henry IV. History informs us that he succeeded in arming against that king the Duke of Savoy, and caused him to lose a city. He succeeded also in engaging the Duke of Biron on his behalf, and caused him to lose his head; but as to this pernicious plant of bravoes, certain it is that it continued to blossom till the 22nd of September, 1612. On that day the most Illustrious Signor Don Giovanni de Mendosa, Marquis of Hynojosa, Gentleman, &c., Governor, &c., had serious thoughts of extirpating it. To this end he sent the usual proclamation, corrected and enlarged, to Pandolfo and Marco Tullio Molatesti, associated printers to His Majesty, with orders to print it to the destruction of the bravoes. Yet they lived to receive on the 24th of December, 1618, similar and more vigorous blows from the most Illustrious and most Excellent Signor, the Signor Don Gomez Suarez di Figueroa, Duke of Feria, &c., Governor, &c. Moreover, they not being hereby done to death, the most Illustrious and most Excellent Signor, the Signor Gonzala Fernandez di Cordova, (under whose government these events happened to Don Abbondio,) had found himself obliged to recorrect and republish the usual proclamation against the bravoes, on the 5th day of October, 1627; i. e. one year one month and two days before this memorable event. Nor was this the last publication. We do not feel bound, however, to make mention of those which ensued, as they are beyond the period of our story. We will notice only one of the 13th of February, 1632, in which the most Illustrious and most Excellent Signor the Duke of Feria, a second time governor, signifies to us that the greatest outrages are caused by those denominated bravoes. This suffices to make it pretty certain, that at the time of which we treat, there was as yet no lack of bravoes. That the two described above were on the lookout for some one, was but too evident; but what more alarmed Don Abbondio was, that he was assured by certain signs that he was the person expected; for, the moment he appeared, they exchanged glances, raising their heads with a movement which plainly expressed that both at once had exclaimed, ‘Here’s our man!’ He who bestrode the wall got up, and brought his other leg into the path: his companion left leaning on the wall, and both began to walk towards him. Don Abbondio, keeping the breviary open before him, as if reading, directed his glance forward to watch their movements. He saw them advancing straight towards him: multitudes of thoughts, all at once, crowded upon him; with quick anxiety he asked himself, whether any pathway to the right or left lay between him and the bravoes; and quickly came the answer,—no. He made a hasty examination, to discover whether he had offended some great man, some vindictive neighbour; but even in this moment of alarm, the consoling testimony of conscience somewhat reassured him. Meanwhile the bravoes drew near, eyeing him fixedly. He put the fore finger and middle finger of his left hand up to his collar, as if to settle it, and running the two fingers round his neck he turned his head backwards at the same time, twisting his mouth in the same direction, and looked out of the corner of his eyes as far as he could, to see whether any one was coming; but he saw no one. He cast a glance over the low wall into the fields—no one; another, more subdued, along the path forward—no one but the bravoes. What is to be done? turn back? It is too late. Run? It was the same as to say, follow me, or worse. Since he could not escape the danger, he went to meet it. These moments of uncertainty were already so painful, he desired only to shorten them. He quickened his pace, recited a verse in a louder tone, composed his face to a tranquil and careless expression, as well as he could, used every effort to have a smile ready; and when he found himself in the presence of the two good men, exclaiming mentally, ‘here we are!’ he stood still. ‘Signor Curato!’ said one, staring in his face. ‘Who commands me?’ quickly answered Don Abbondio, raising his eyes from the book, and holding it open in both hands. ‘But,’ (this time the other companion broke in, who had not hitherto spoken)—‘but the marriage is not to be performed, or…’ here a great oath—‘or he who performs it will never repent, because he shall have no time for it…’ another oath. ‘…Disposed … always disposed to obedience.’ And having said these words, he did not himself well know whether he had given a promise, or whether he had only sent an ordinary compliment. The bravoes took it, and showed that they took it, in the more serious meaning. ‘Very well—good evening, Signor Curato,’ said one of them, leading his companion away. Don Abbondio, who a few moments before would have given one of his eyes to have got rid of them, now wished to prolong the conversation and modify the treaty;—in vain they would not listen, but took the path along which he had come, and were soon out of sight, singing a ballad, which I do not choose to transcribe. Poor Don Abbondio stood for a moment with his mouth open, as if enchanted: and then he too departed, taking that path which led to his house, and hardly dragging one leg after the other, with a sensation of walking on crab-claws, and in a frame of mind which the reader will better understand, after having learnt somewhat more of the character of this personage, and of the sort of times in which his lot was cast. Don Abbondio—the reader may have discovered it already—was not born with the heart of a lion. Besides this, from his earliest years, he had had occasion to learn, that the most embarrassing of all conditions in those times, was that of an animal, without claws, and without teeth, which yet, nevertheless, had no inclination to be devoured. The arm of the law by no means protected the quiet inoffensive man, who had no other means of inspiring fear. Not, indeed, that there was any want of laws and penalties against private violence. Laws came down like hail; crimes were recounted and particularized with minute prolixity; penalties were absurdly exorbitant; and if that were not enough, capable of augmentation in almost every case, at the will of the legislator himself and of a hundred executives; the forms of procedure studied only how to liberate the judge from every impediment in the way of passing a sentence of condemnation; the sketches we have given of the proclamations against the bravoes are a feeble but true index of this. Notwithstanding, or rather in great measure for this reason, these proclamations, republished and reenforced by one government after another, served only to attest most magniloquently the impotence of their authors; or if they produced any immediate effect, it was for the most part to add new vexations to those already suffered by the peaceable and helpless at the hands of the turbulent, and to increase the violence and cunning of the latter. Impunity was organized and implanted so deeply that its roots were untouched, or at least unmoved, by these proclamations. Such were the asylums, such were the privileges of certain classes, privileges partly recognized by law, partly borne with envious silence, or decried with vain protests, but kept up in fact, and guarded by these classes, and by almost every individual in them, with interested activity and punctilious jealousy. Now, impunity of this kind, threatened and insulted, but not destroyed by the proclamations, was naturally obliged, on every new threat and insult, to put in force new powers and new schemes to preserve its own existence. So it fell out in fact; and on the appearance of a proclamation for the restraint of the violent, these sought in their power new means more apt in effecting that which the proclamations forbade. The proclamations, indeed, could accomplish at every step the molestation of a good sort of men, who had neither power themselves nor protection from others; because, in order to have every person under their hands, to prevent or punish every crime, they subjected every movement of private life to the arbitrary will of a thousand magistrates and executives. But whoever, before committing a crime, had taken measures to secure his escape in time to a convent or a palace, where the birri 1 had never dared to enter; whoever (without any other measures) bore a livery which called to his defence the vanity and interest of a powerful family or order, such an one was free to do as he pleased, and could set at nought the clamour of the proclamations. Of those very persons to whom the enforcing of them was committed, some belonged by birth to the privileged class, some were dependent on it, as clients; both one and the other by education, interest, habit, and imitation, had embraced its maxims, and would have taken good care not to offend it for the sake of a piece of paper pasted on the corners of the streets. The men entrusted with the immediate execution of the decrees, had they been enterprising as heroes, obedient as monks, and devoted as martyrs, could not have had the upper hand, inferior as they were in number to those with whom they would have been engaged in battle, with the probability of being frequently abandoned, or even sacrificed, by those who abstractedly, or (so to say) in theory, set them to work. But besides this, these men were, generally, chosen from the lowest and most rascally classes of those times: their office was held base even by those who stood most in fear of it, and their title a reproach. It was therefore but natural that they, instead of risking, or rather throwing away, their lives in an impracticable undertaking, should take pay for inaction, or even connivance at the powerful, and reserve the exercise of their execrated authority and diminished power for those occasions, where they could oppress, without danger, i. e. by annoying pacific and defenceless persons. The man who is ready to give and expecting to receive offence every moment, naturally seeks allies and companions. Hence the tendency of individuals to unite into classes was in these times carried to the greatest excess; new societies were formed, and each man strove to increase the power of his own party to the greatest degree. The clergy were on the watch to defend and extend their immunities; the nobility their privileges, the military their exemptions. Tradespeople and artisans were enrolled in subordinate confraternities, lawyers constituted a league, and even doctors a corporation. Each of these little oligarchies had its own peculiar power; in each the individual found it an advantage to avail himself, in proportion to their authority and vigour, of the united force of the many. Honest men availed themselves of this advantage for defence; the evil-disposed and sharp-witted made use of it to accomplish deeds of violence, for which their personal means were insufficient, and to ensure themselves impunity. The power, however, of these various combinations was very unequal; and especially in the country, a rich and violent nobility, having a band of bravoes, and surrounded by a peasantry accustomed by immemorial tradition, and compelled by interest or force, to look upon themselves as soldiers of their lords, exercised a power against which no other league could have maintained effectual resistance. Our Abbondio, not noble, not rich, not courageous, was therefore accustomed from his very infancy to look upon himself as a vessel of fragile earthenware, obliged to journey in company with many vessels of iron. Hence he had very easily acquiesced in his parents’ wish to make him a priest. To say the truth, he had not reflected much on the obligations and noble ends of the ministry to which he was dedicating himself: to ensure something to live upon with comfort, and to place himself in a class revered and powerful, seemed to him two sufficient reasons for his choice. But no class whatever provides for an individual, or secures him, beyond a certain point: and none dispenses him from forming his own particular system. Don Abbondio, continually absorbed in thoughts about his own security, cared not at all for those advantages which risked a little to secure a great deal. His system was to escape all opposition, and to yield where he could not escape. In all the frequent contests carried on around him between the clergy and laity, in the perpetual collision between officials and the nobility, between the nobility and magistrates, between bravoes and soldiers, down to the pitched battle between two rustics, arising from a word, and decided with fists or poniards, an unarmed neutrality was his chosen position. If he were absolutely obliged to take a part, he favoured the stronger, always, however, with a reserve, and an endeavour to show the other that he was not willingly his enemy. It seemed as if he would say, ‘Why did you not manage to be stronger? I would have taken your side then.’ Keeping a respectful distance from the powerful; silently bearing their scorn, when capriciously shown in passing instances; answering with submission when it assumed a more serious and decided form; obliging, by his profound bows and respectful salutations, the most surly and haughty to return him a smile, when he met them by the way; the poor man had performed the voyage of sixty years without experiencing any very violent tempests. It was not that he had not too his own little portion of gall in his disposition: and this continual exercise of endurance, this ceaseless giving reasons to others, these many bitter mouthfuls gulped down in silence, had so far exasperated it, that had he not an opportunity sometimes of giving it a little of its own way, his health would certainly have suffered. But since there were in the world, close around him, some few persons whom he knew well to be incapable of hurting, upon them he was able now and then to let out the bad humour so long pent up, and take upon himself (even he) the right to be a little fantastic, and to scold unreasonably. Besides, he was a rigid censor of those who did not guide themselves by his rules; that is, when the censure could be passed without any, the most distant, danger. Was any one beaten? he was at least imprudent;—any one murdered? he had always been a turbulent meddler. If any one, having tried to maintain his right against some powerful noble, came off with a broken head, Don Abbondio always knew how to discover some fault; a thing not difficult, since right and wrong are never divided with so clean a cut, that one party has the whole of either. Above all, he declaimed against any of his brethren, who, at their own risk, took the part of the weak and oppressed against the powerful oppressor. This he called paying for quarrels, and giving one’s legs to the dogs: he even pronounced with severity upon it, as a mixing in profane things, to the loss of dignity to the sacred ministry. Against such men he discoursed (always, however, with his eyes about him, or in a retired corner) with greater vehemence in proportion as he knew them to be strangers to anxiety about their personal safety. He had, finally, a favourite sentence, with which he always wound up discourses on these matters, that a respectable man who looked to himself, and minded his own business, could always keep clear of mischievous quarrels. My five-and-twenty readers may imagine what impression such an encounter as has been related above would make on the mind of this pitiable being. The fearful aspect of those faces; the great words; the threats of a Signor known for never threatening in vain; a system of living in quiet, the patient study of so many years, upset in a moment; and, in prospect, a path narrow and rugged, from which no exit could be seen,—all these thoughts buzzed about tumultuously in the downcast head of Don Abbondio. ‘If Renzo could be dismissed in peace with a mere no, it is all plain; but he would want reasons; and what am I to say to him? and—and—and he is a lamb, quiet as a lamb if no one touches him, but if he were contradicted … whew! and then—out of his senses about this Lucia, in love over head and … These young men, who fall in love for want of something to do, will be married, and think nothing about other people, they do not care anything for the trouble they bring upon a poor curate. Unfortunate me! What possible business had these two frightful figures to put themselves in my path, and interfere with me? Is it I who want to be married? Why did they not rather go and talk with … Let me see: what a great misfortune it is that the right plan never comes into my head till it is too late! If I had but thought of suggesting to them to carry their message to…’ But at this point it occurred to him that to repent of not having been aider and abettor in iniquity, was itself iniquitous; and he turned his angry thoughts upon the man who had come, in this manner, to rob him of his peace. He knew Don Rodrigo only by sight and by report; nor had he had to do with him further than to make a lowly reverence when he had chanced to meet him. It had fallen to him several times to defend this Signor against those who, with subdued voice and looks of fear, wished ill to some of his enterprises. He had said a hundred times that he was a respectable cavalier; but at this moment he bestowed upon him all those epithets which he had never heard applied by others without an exclamation of disapprobation. Amid the tumult of these thoughts he reached his own door—hastily applied the key which he held in his hand, opened, entered, carefully closed it behind him, and anxious to find himself in trustworthy company, called quickly, ‘Perpetua, Perpetua!’ as he went towards the dining-room, where he was sure to find Perpetua laying the cloth for supper. Perpetua, as every one already knows, was Don Abbondio’s servant, a servant affectionate and faithful, who knew how to obey and command in turn as occasion required—to bear, in season, the grumblings and fancies of her master, and to make him bear the like when her turn came; which day by day recurred more frequently, since she had passed the sinodal age of forty, remaining single, because, as she said herself, she had refused all offers, or because she had never found any one goose enough to have her, as her friends said. ‘I am coming,’ replied Perpetua, putting down in its usual place a little flask of Don Abbondio’s favourite wine, and moving leisurely. But before she reached the door of the dining-room, he entered, with a step so unsteady, with an expression so overcast, with features so disturbed, that there had been no need of Perpetua’s experienced eye to discover at a glance that something very extraordinary had happened. ‘Nothing, nothing,’ replied Don Abbondio, sinking down breathless on his arm-chair. ‘And you will persist, sir, that it is nothing!’ said Perpetua, filling the glass; and then holding it in her hand, as if she would give it in payment for the confidence he kept her waiting for so long. ‘Give it here, give it here,’ said Don Abbondio, taking the glass from her with no very steady hand, and emptying it hastily, as if it were a draught of medicine. ‘Do you wish me, then, sir, to be obliged to ask here and there, what has happened to my master?’ said Perpetua, right opposite him, with her arms akimbo, looking steadily at him, as if she would gather the truth from his eyes. 2 It is a custom in Italy, during the carnival, for friends to salute each other with showers of comfits, as they pass in the streets. So saying, he took the candle, and constantly grumbling, ‘A nice little business to a man like me! and to-morrow, what is to be done?’ with other like lamentations, went to his chamber, to lie down. When he had reached the door, he paused a moment, turned round and laid his finger on his lips, pronouncing slowly and solemnly, ‘For Heaven’s sake!’ and disappeared. Note 1. i. e., the armed police.